Details for Marella Dream can be found below. 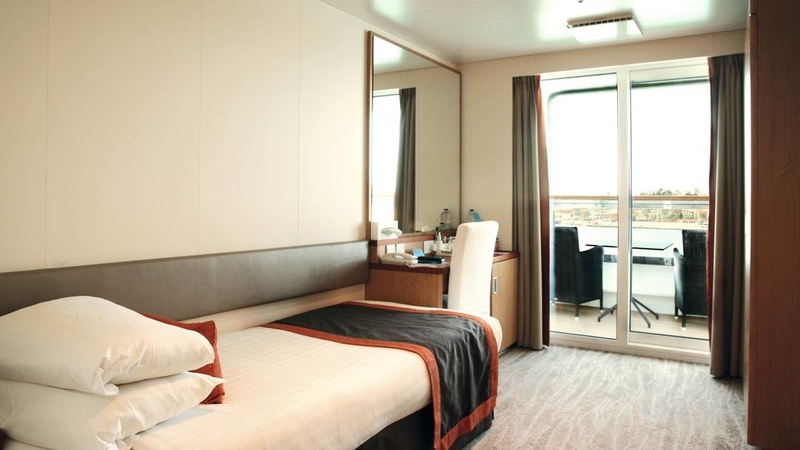 Plenty of space and a brilliant selection of facilities - that's what you can expect on Marella Dream. The restaurants, lounges and bars have been treated to a stylish makeover. As for the entertainment, our plush show lounge sets the scene for glam West End-style shows and UK comedy acts. Elsewhere, there’s plenty of room for live music and daytime games for the whole family. 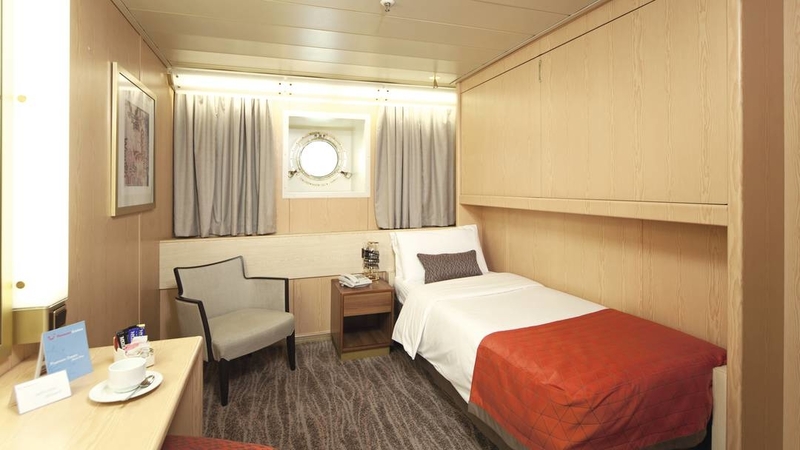 When a porthole just doesn’t cut it, book one of our balcony cabins. They come with twin beds that can be converted into a queen-sized one, plus an en suite bathroom with a shower. As for the balconies, they’re kitted out with a couple of comfortable chairs and a table. 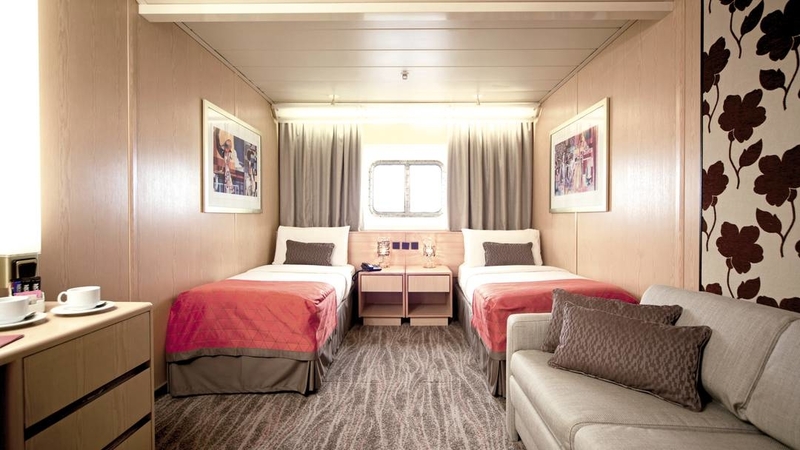 Fresh and modern, our deluxe cabins accommodate up to 3 people – 2 single beds are convertible to a queen-size bed and the sofa becomes a bed if it’s needed. There's a roomy lounge area with a sofa, table and chairs, and a picture window. The en suite bathrooms have a shower over a bath and a WC. Towels and bathrobes are provided. Size-wise, you've got 20m² of space. 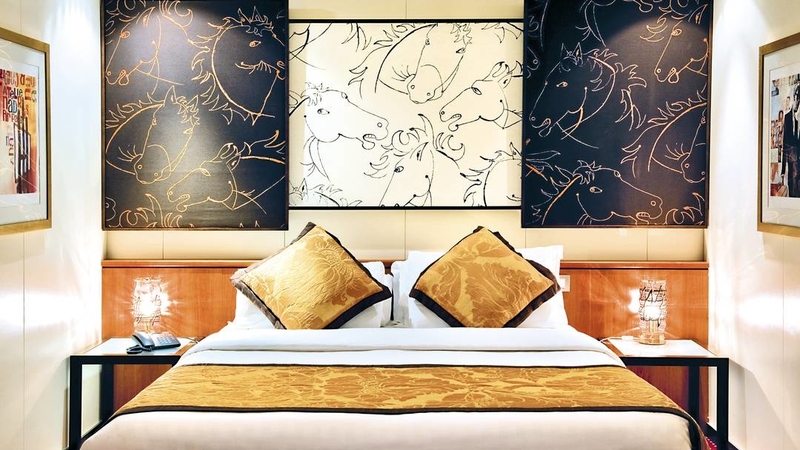 There are 6 Grand Suites to the fore of the ship – 3 portside and 3 starboard. This is the top package. 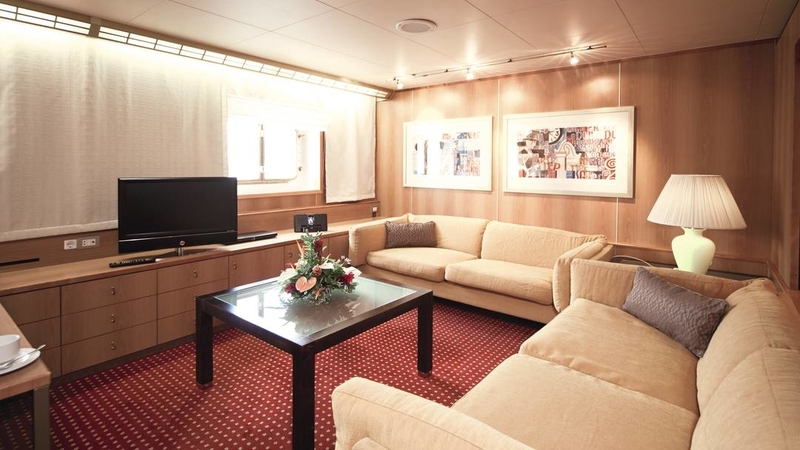 These cabins come with balconies, and you can expect a spacious set-up over 40m². Dark-wood furniture paired with contemporary wall art and soft fabrics makes them really classy. Each living area has a flatscreen TV, 2 cosy sofas and a DVD player. In the separate bedroom, 2 single beds convert to a queen-size bed, and the roomy bathroom has a shower over a whirlpool bath and a WC. A minibar, tea and coffee-making facilities, a walk-in wardrobe, and bathrobes are included for maximum comfort. Additional foldaway upper berths accommodate an extra 1 or 2 people. 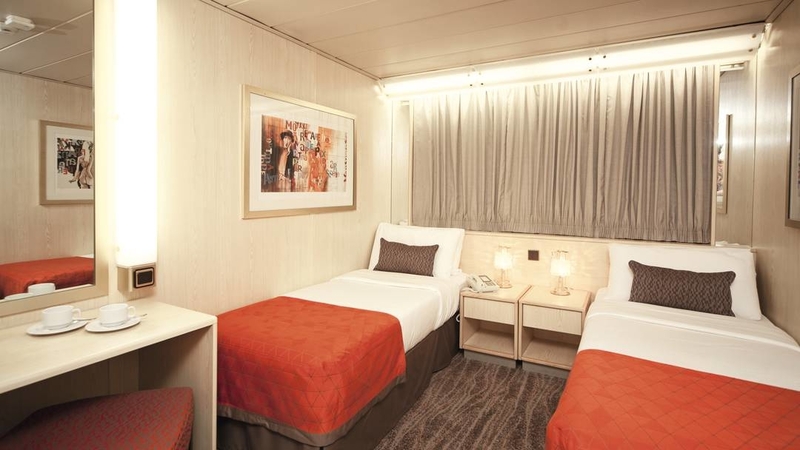 These cabins have 2 single beds that can be converted to a queen-size bed or a fixed double. The en suite bathrooms have a shower and WC. 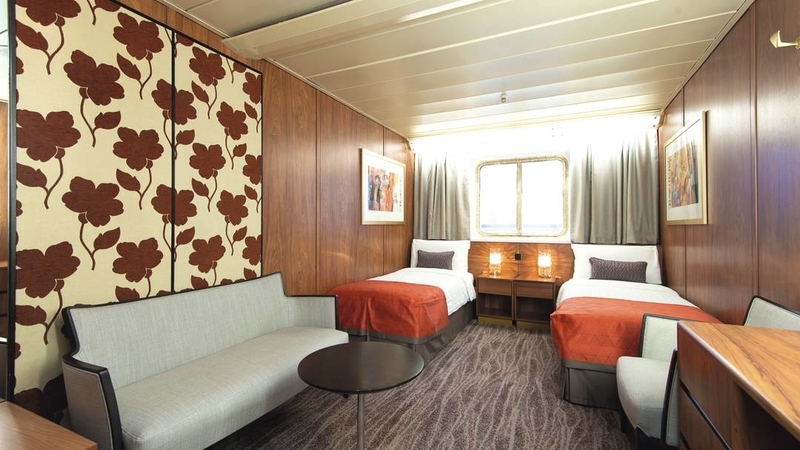 Our 3- and 4-berth cabins have additional upper berths that fold away. Size-wise, they’re 12-13m². Each of these cabins has a picture-window porthole. 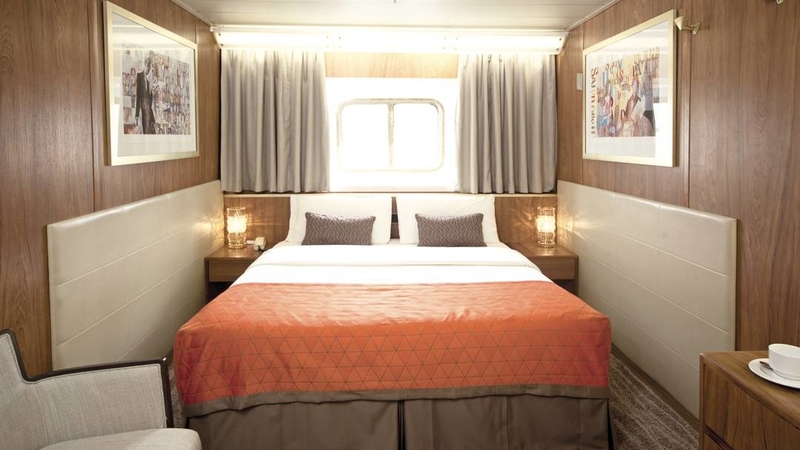 As well as offering 2 beds that convert to a queen-sized bed, some of them have additional foldaway upper berths, or a sofa-bed to accommodate an extra 1 or 2 people. These cabins come with an en suite wet room. 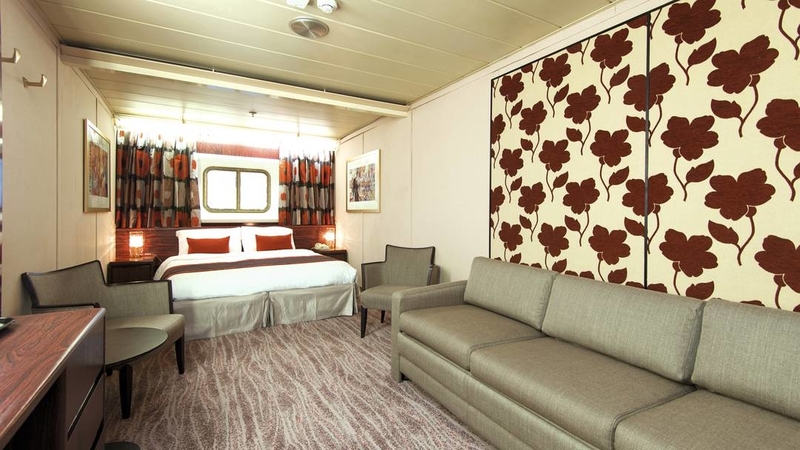 Balcony cabins come with a furnished balcony, and a single bed - plus an en suite bathroom with shower. 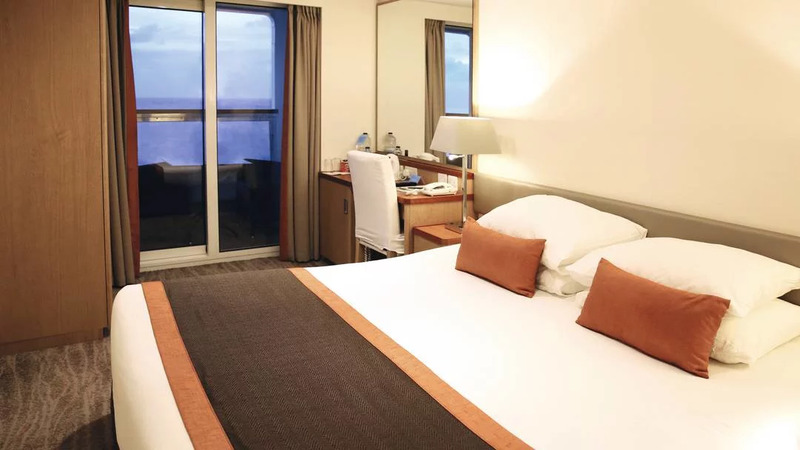 For solo travellers our single balcony cabins come with a furnished balcony, and a smaller bed – plus an en suite bathroom with shower. We’ve only got 5 Suites on board, so book one early for a cruise with all the trimmings. Each one has a well-dressed living area with wide windows and 2 corduroy sofas around a glass coffee table. The separate bedroom has calming fabrics and a queen-size bed. A large ensuite bathroom has a roomy walk-in shower and a WC. A walk-in wardrobe, bath robes and a DVD player make for a comfortable stay. For families, there are additional foldaway upper berths. You won’t be short of space, either, with 35m² to play with. Mediterranean Medley by Treasures of the Med. write a review of Marella Dream.